Technical writing requires a mastery of the English language, and great attention to detail. For those work at home moms who fit the bill, it can be a great career choice. Technical writing is a skill that can easily allow you to work at home. A technical writer typically works alone, or remotely as part of a team of writers, to produce documents and manuals for businesses or other professional fields. 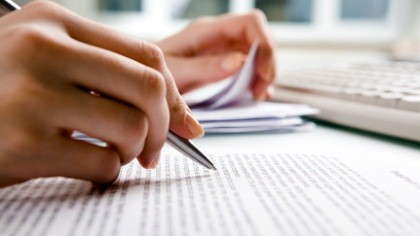 An English or a Technical Writing degree is preferred by employers hiring writers in this area. Others have a degree in a specialized field, such as medicine, engineering or science, and then take courses to learn technical communication skills. They need to be experts at fact-checking and be able to pay attention to small details; the people who read the technical documents they produce are sometimes experts within a field, and will easily spot careless work or fact errors. Technical writers also need to be able to conduct independent research, and interview experts within specific fields to gain the information needed to produce documents or training manuals. Some use their bilingual skills to produce or translate technical documents. Technical writers usually specialize in one field of writing, such as medical documents or how-to manuals within a specific field. The work that a technical writer produces can be online or in printed form. You may be hired to produce shorter technical documents on your own, or as a part of a team of technical writers. Teams are used to produce lengthy technical documents, with each writer assigned a portion of the work. Once you've been hired for a technical writing job, you'll start the research phase. This will include online research and reading from other technical manuals or documents. It may also require interviewing people who are experts on the subject matter and compiling the information from those interviews. You'll need to study the audience who will be reading the document as well, to determine their level of technical skill. For example, the amount of technical detail that goes into a training manual for retail store employees would be very different from a manual that describes a piece of aerospace technology for professional engineers. Once the research phase is complete, you'll write a draft of the document. A finished draft of the document or program is submitted to the client, and an expert or team of experts will proof it for errors, consistency and level of expertise. The document may go through one or more rewrites before the finished product is ready for publication. Because of the technical nature and research involved, technical writers are paid higher rates than regular freelance writers. Salaries can range from $30 to $75 per hour, depending on your level of experience and field of knowledge. A home based business as a technical writer can be very profitable if you have the necessary skills and training. It's typically less competitive than trying to get other freelance writing jobs. The sooner you can show published or hired works on your resume, the faster you'll gain income to work at home full time.